In my last post, we examined the Common Structure of the Seven Letters to the Messianic Communities and the Special Comparative Note for Chapters 2 & 3. 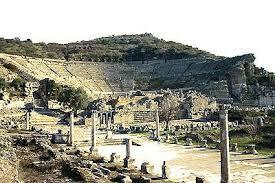 In this post, Yeshua’s letter to the Messianic Community at Ephesus will be examined. Ephesus was the capital of Asia Minor, a center of land and sea trade, and, along with Alexandria and Antioch in Syria, one of the three most influential cities in the eastern part of the Roman Empire. 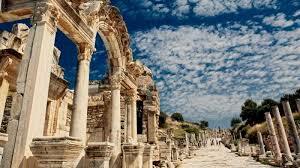 From Ephesus goods were shipped to other Mediterranean ports. 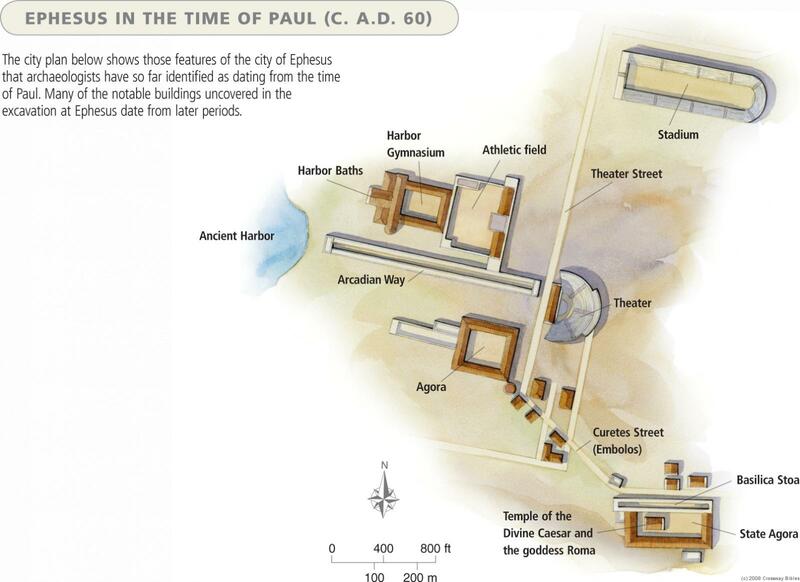 This hug city contained a theater (seating about 25,000; Acts 19:29); an agora (“town square” that also served as the marketplace of goods and ideas), public baths, a library, and several temples. Click on image for larger view and then click on your Back arrow to return. The temple of Artemis, one of the ancient wonders of the world, was in this city, and a major industry was the manufacture of images of this goddess (see Acts 19:21-41). The congregation had been founded by Aquila and Pricilla (Acts 18:18) and with Sha’ul’s guidance it quickly became an evangelistic center (Acts 19:10). Timothy later took Sha’ul’s place (1 Timothy 1:3). Sha’ul ministered in Ephesus for three years and warned that false teachers would come ad try to draw people away from the faith (see Acts 20:29-31). False teachers did indeed cause problems in the Ephesian church, but the church resisted them, as we can see from Sha’ul’s letter to the Ephesians. Yochanan spent much of his ministry in this city and knew that they had resisted false teaching. In a previous post, we established that “The one who holds the seven stars in his right hand and walks among the seven gold menorahs” is none other than Yeshua Himself. We also addressed the mystery of the seven stars by stating they represent the angels of the Messianic Communities that we will be addressing in this and continuing posts. Some say that the angels are designated to guard the churches; others say that they are elders or pastors of the local churches. Because the seven letters in chapters 2 and 3 contain reprimands, it is doubtful that these angels are heavenly messengers. If these are earthly leaders or messengers, they are accountable to God for the churches they represent. The seven gold menorahs are the communities (churches) to which this and the other six letters are addressed. I know what you have been doing, how hard you have worked, how you have persevered, and how you can’t stand wicked people. This church got off to a great start. Think about having Sha’ul, Timothy, and Yochanan serving as pastors and the kind of church that would have been developed. Our Lord commends the church for their work, their labor and their patience, which were all the result of love. Add this, that it was a strong church, which had deep convictions; they knew what was right and what was wrong. So you tested those who call themselves emissaries but aren’t — and you found them to be liars. This church openly condemned falsehood wherever they found it, in the world or among their own members! They were also concerned about those who filled the pulpit! Visiting ministers were carefully examined by this body of Believers to determine if they were genuine. They were on their toes in preventing false prophets from leading the congregation astray. You are persevering, and you have suffered for my sake without growing weary. It is important to note that patience and bearing up are slightly different from what was stated in verse two. The difference is between service and suffering. In verse two, works, toil and patience are associated with service, but in verse three patience and bearing up are associated with suffering. But I have this against you: you have lost the love you had at first. With all the good that is said about the church, nonetheless, at the most critical point, it failed. The church lost its affection for Yeshua, for one another and for the lost. To lose sight of love is to lose sight of everything. It is possible to be so caught up in church work that we neglect the Savior. We should never be so busy working for the Kingdom that we lose sight of our devotion to Yeshua. He wants more than anything else to have sweet fellowship with us and the church at Ephesus forgot that. First love must be that devotion to Yeshua that so often characterizes the new convert. This same devotion drives us to share the Besorah. It is at the point of witnessing that the power (Acts 1:8) of God is upon us. That love must involve the sharing of our faith with the lost around us. Therefore, remember where you were before you fell, turn from this sin, and do what you used to do before. This verse incorporates a threefold admonition. Remember. Yochanan is not talking about individual apostasy here. He is speaking to the church body and warning them about possible removal of the menorah from the church. To cease to love is always to fail; therefore, Yochanan admonishes them to recall how it was in earlier years. Turn from this sin (or repent). When we first become aware of sin, then through the Ruach we become disturbed about it, and then, to finalize repentance, there must be an act of the will to turn from it. Do what you used to do before. Go back to living as you did at first. Remember when you first were saved, how you wanted to share your experience with everyone? You couldn’t get enough of church, fellowship, or insight in the Word of God. Otherwise, I will come to you and remove your menorah from its place — if you don’t turn from your sin! The sad commentary on Ephesus is that it failed to heed the warning and the menorah (a symbol of the light and testimony of Yeshua) was eventually removed. This should serve as a clear warning to all churches of all ages. Yeshua said, “Everyone will know that you are my talmidim by the fact that you have love for each other.” ~ Yochanan 13:35. No matter what might be said about a church and its accomplishments, if it fails to have a genuine love for Yeshua and one another, it fails totally. But you have this in your favor: you hate what the Nicolaitans do — I hate it too. With the growing number of false teachers (those who claimed to be apostles and were not), there developed a faulty consensus of leadership. These false teachers (2 Corinthians 11:13-15) usurped power in a way that was never intended and, eventually, there arose a distinction between clergy and laity. Nicolaitans were a heretical sect. Like the prophet, Balaam, they seduced God’s people to participate in idolatry and sexual morality, perhaps disguising antinomian license as freedom in Yeshua (see 1 Corinthians 6:12-20; 8:1-11:1). To eat from the Tree of Life means to have eternal life. Genesis 2:9; 3:22, 24 shows that this was true in the original Gan-Eden (Garden of Eden). It is also true of God’s Gan-Eden, which is the New Jerusalem (see Revelation 22:2, 14 19). In the Tanakh the term tree of life is used in Proverbs 3:18, 11:30, 13:12 and 15:14 to describe, the fruit of the righteous, desire fulfilled and wholesome tongue – all of which may be seen as aspects of eternal life. Among Historicist and some Futurists, Ephesus is said to represent the condition of the church of the apostolic age until the end of the first century of the Common Era (CE). In my next post, we will look at the letter to the Messianic Community in Smyrna.